In the Middle Ages, St. Catherine's Church and Abbey in Ribe was the home of Dominican friars, also called blackfriars". It was established in 1228. The Dominicans were an order of mendicant friars who were not permitted to own worldly goods and eked out a living from begging. Their main task was to preach and hear confessions. After the Reformation in 1536, the church was converted into a parish church and the abbey became a hospital. Today, it functions as a kind of nursing home. The east wing was demolished in the 17th century but otherwise it is one of Denmark's best preserved mediaeval monasteries. " St. Catherine's Abbey is close to Ribe River. Too close. In the autumn of 1532, during a storm the river flooded and the friars could catch fish in the cloisters. The abbey stood on land that was so soft that any church built there will sink. The first two churches sank so much that they had to be rebuilt even before the end of the Middle Ages. In 1918-32 a major new restoration project was launched to save the third St. Catherine's Church (from the 15th century). You can see how the course of bricks in the north wall slopes downwards. Below, in the cellar under the choir stalls, a jack is still visible bricked into the wall. 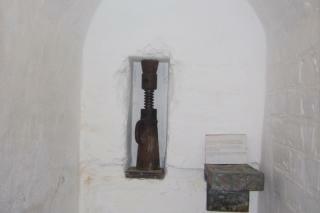 It was used to raise the old church during its restoration.